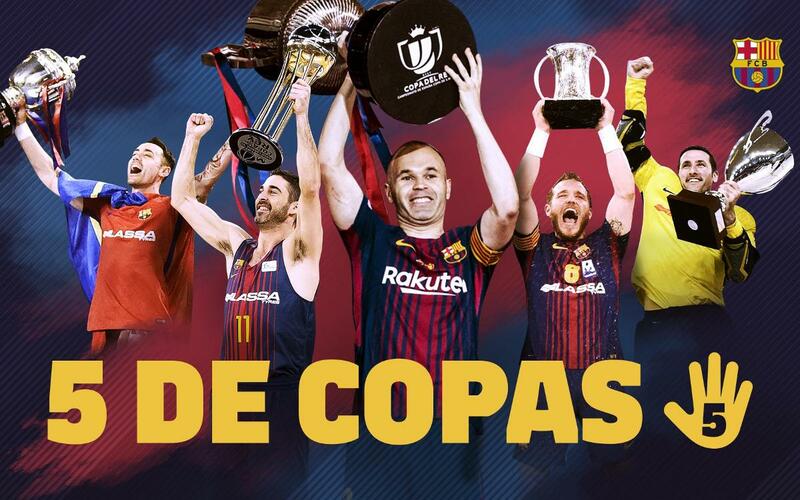 A historic achievement for FC Barcelona as they claim the five domestic cup competitions in each of the five professional sports in which the Club competes. The full house was completed with wins over the weekend for Barça Lassa in futsal and handball, adding themselves to the titles claimed by the football first team, basketball and roller hockey teams, previously never achieved in the same season at FC Barcelona. Basketball claimed their cup victory first in February when Svetislav Pesic’s team beat Real Madrid 92-90 in the final of the competition. A week later in the same month, the roller hockey side added the cup to their honours with a 2-1 win against Liceo. The football first team contributed with their memorable 5-0 win over Sevilla in the Copa del Rey final in the Wanda Metropolitano in Madrid in the month of April. Finally, in May the futsal and handball team claimed their respective domestic cpups, the former beating Jaén 4-3 in the final played in Cáceres and the latter overcoming Logroño by 35-28 in their final played in Madrid.